The vertebral bodies are stacked one on top of another to form the entire structure of the spine. 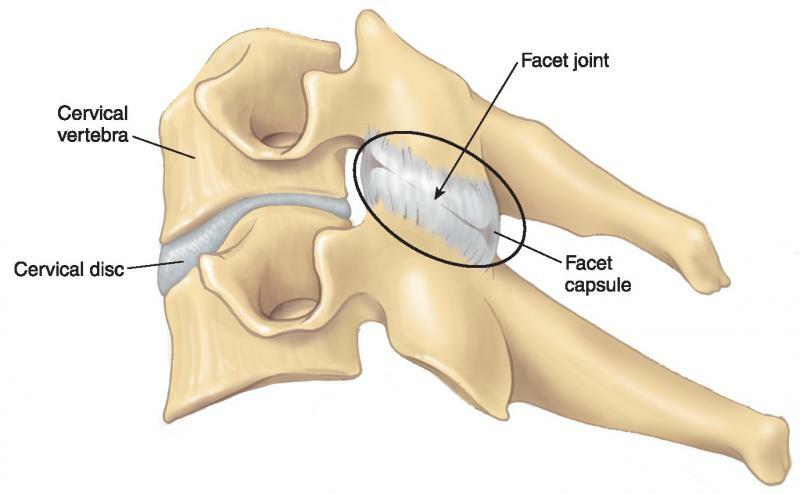 On each side of the vertebral bodies are tiny joints called facet joints. Facet Joint Syndrome is a condition in which arthritic change and inflammation occur, and the nerves to the facet joints convey severe and diffuse pain. The pain does not follow a nerve root pattern. It is actually called “referred pain,” as the brain has trouble localizing these internal structures. Patients often complain of pain in a generalized, poorly defined region of the neck or back. There may be some tenderness overlying the involved joints as well. It is usually caused by trauma (auto accident, whiplash, a bad fall) and a degenerated or herniated disc. These all cause the spine to sublux (move out of joint) and the joint capsule to become irritated. It is usually worsened by sudden movements or prolonged episodes of poor posture, (e.g., kneeling in the garden, bending over to lift, or straining to read a book or look at a computer terminal). Many patients find the worst time is at night, when all the muscles relax and the joints grind together. It can be mistaken for a condition called fibromyalgia or for myofascial syndrome. Often, there is an associated spasm of the muscles in the paraspinal region [on either side of the spine], which can further confuse the diagnosis. The diagnosis is made by physical examination, MRI, or x-rays and a diagnostic block into the facet joint (facet joint injection). 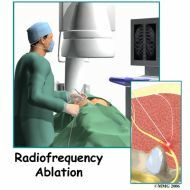 A heat injection procedure called radiofrequency abalation is used to treat facet joint syndrome. Its goal is to block the nerves that send pain from the facet joints.